Guildford, UK, 1 March 2019 – Today, Linde plc (NYSE:LIN; FWB:LIN) announced the restrictions under the hold separate order issued by the US Federal Trade Commission have been lifted following the completion of certain required divestitures in the US. This spallation source would not be possible without sophisticated and extremely capable cooling systems. Linde Kryotechnik supplied the most import cryogenic parts, including two coldboxes, each being a one of a kind. Two mobile cranes with long telescope arms are already waiting as the heavy low-bed trailer arrives at the giant building site in Lund. Its valuable cargo, a coldbox, has the shape of a white zeppelin, measuring 10 metres in length and 3.5 metres in diameter. While this shell may look unimposing, it actually contains sophisticated technical equipment, a one-of-a-kind coldbox that will cool parts of the the world’s most powerful neutron source down to temperatures around 16 kelvins, or -257 degrees Celsius. In September 2018, after a long journey through Europe, the 40-ton coldbox reached its destiny, the site of the European Spallation Source (ESS). Now, one year later, the second vessel is being lifted by two cranes in front of the gate at the side of the oblong klystron gallery that runs along the accelerator tunnel. Since it is too big to be driven in on the back of a trailer, it has to be offloaded and placed on small rolls. The crane operators are deepening the 40-ton cylinder slowly and carefully laying it down. Success is a matter of centimetres, but the experienced workers manage to place the vessel safely on the rolls. Supported by a forklift truck, they pull the coldbox inside the hall, passing a jungle of pipelines, machines, measuring apparatuses and more. Now, however, the task is a matter of millimetres. The workers need a whole day to manoeuvre it to its place, next to its big brother, the ACCP. As planned the second experimental campaign of the world’s largest fusion experiment of the stellarator-type, the Wendelstein 7-X, was finished before Christmas 2017. All components functioned correctly and allowed the scientists to run the experiment with up to 75 Mega Joule for 30 seconds. The third and last part of the experimental series is planned to start in July 2018 and will verify the possibility of a continuous operation of the stellerator. Read the complete newsletter over the Wendelstein 7-X at the Homepage of IPP. For more information about the contribution of Linde Kryotechnik to the Wendelstein 7-X project click here. In November 2017, General Atomics published a paper describing the performance of its ITER test facility and qualifying its suppliers. This paper shows that, once again, Linde Kryotechnik has successfully designed, produced, installed and commissioned a refrigeration system for the ITER project. The world’s largest fusion experiment of the stellarator type Wendelstein 7-X is in action for the second time. The stellarator is running again after a 15-month conversion break, which served to equip the machine for longer pulses and higher heating power. The next step in a continuous increase in the energy level and the operating time is thus possible. Although Wendelstein 7-X is not meant to produce energy, the device is intended to prove that stellarators are suitable for power stations. For the first time, the quality of the plasma confinement in a stellarator is to reach the level of the competing tokamak type devices. Gradually, the duration of discharges will be increased and in a few years’ time the duration will be at 30 minutes. This data could be used to obtain information if the large advantage of the stellarator type is possible: continuous operation. Scope of supply of Linde Kryotechnik for the Wendelstein 7-X Project. This video produced by US ITER in collaboration with General Atomics (GA) describes the work underway in the United States to fabricate the ITER central solenoid. The cryogenic plant of Linde Kryotechnik is used for testing at 50 Kiloampère and 4 Kelvin. On 18 August 2017, Linde Kryotechnik delivered the core component of the refrigeration system for the European Spallation Source (ESS) accelerator. This was one of the biggest transport undertakings yet for the massive ESS project, with an oversize consignment measuring 39 m in length and 4.6 m in width arriving at the ESS grounds. Moving the coldbox at all was a challenge – it is 14 m long and 4.7 m high with a diameter of 3.5 m and weight of 50 tonnes. Time and again, it pushed the boundaries of feasibility and called for new solutions – whether it be to assemble the inner workings with the outer shell or ready the box for shipping. For transport by road, obstacles like roundabouts and signage had to be dismantled by an advance team and put back again once the vehicle had passed. Transport by sea was not possible from ports near Lund as they were not equipped to handle cargo with such huge dimensions. Ultimately, the cargo had to travel from Basel via Gent to Gothenburg for shipping. This resulted in a final onshore stage, where the transporter had to navigate an underpass with a guideline clearance of as little as 3 cm. After 15 days en route, the cargo reached its destination at the ESS site in Lund, Sweden. It took one whole day to manoeuvre the delivery into the unloading hall. The plant will be installed here in the next few months and the completed system is set to be handed over to ESS in autumn 2018. The second order from ESS, the TMCP (Target Moderator Cryo Plant), is under construction. Since 1952, ETH Zurich has been liquefying helium. The university of science and technology turned to its trusted partner, Linde Kryotechnik, to help with plans to revamp an existing helium liquefaction unit and replace another one with a new liquefier. The physics department of ETH Zurich supplies liquid helium to various R&D teams within ETH and also to the University of Zurich. When using helium, ETH Zurich recovers and reliquefies most of the gas. It does this with two TCF20 helium liquefier systems delivered and installed by Linde Kryotechnik in 1995 and 1999. 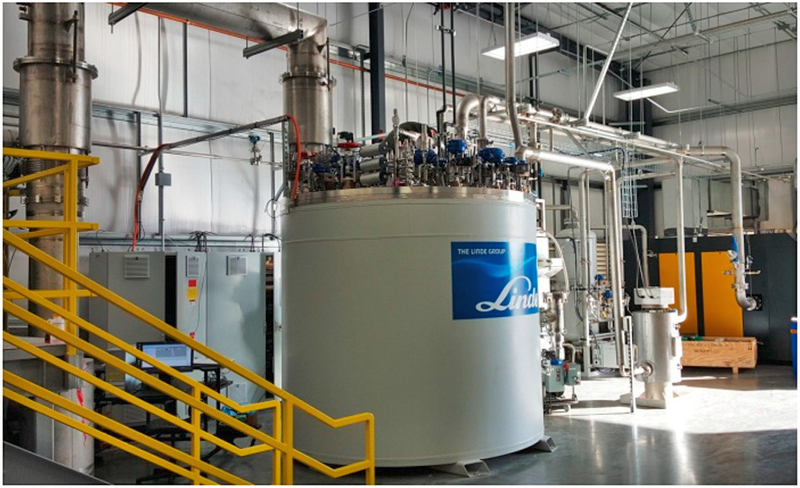 Moving forward, ETH Zurich intends to meet rising demand for liquid helium to support research and development projects with a new L140 helium liquefier. The plan is to replace one of the outdated TCF20 units and revamp the second TCF20 unit. The revamp involves upgrading the TCF20 to the control system of the L-Series and replacing various sensors and actuators. This revamped model will be as easy to operate as the modern L-Series plants. Commissioning of the new L140 helium liquefier is scheduled for May 2018. On May 4th, 2017 DESY and XFEL reported that the most powerful of five X-ray lasers in the world has sent its first beam into the 3.4 km tunnel. One of our most important customers celebrates a great success. The consolidated financial statements of Linde Aktiengesellschaft for the year ended 31 December 2016 have been prepared in accordance with International Financial Reporting Standards (IFRS) issued by the International Accounting Standards Board (IASB) as adopted by the European Union pursuant to EU Regulation No. 1606/2002 of the European Parliament and the Council on the application of International Accounting Standards in the European Union. The report consists of two parts, the Financial Report and the Annual. The following link leads you to the download section of the Linde reports. The financial report of Linde Kryotechnik AG forms an integral part of the Linde AG balance.